The 7th and 8th KONDO BATTLE sponsored by KONDO KAGAKU CO., LTD took place on Sep 23, 2011 at ROBOSPOT in Akihabara, TOKYO. The 7th KONDO BATTLE was carried out as Student Class and the 8th KONDO BATTLE was carried out as Open Class and Exhibition Class. 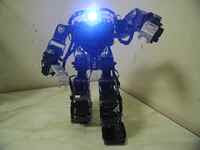 Exhibition Class could be joined who has the right to join the 19th ROBO-ONE in Kawasaki on Oct 8-9, 2011. The main regulation following the 19th ROBO-ONE was the weight of robot, which had to be 3 kg or under 3 kg. Winner of the Student Class and Open Class could get rights to join the 19th ROBO-ONE tournament. 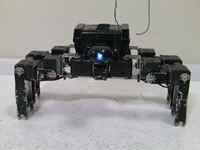 Fourteen robots; Student Class 3, Open Class 7 and Exhibition Class 4, joined the competition. Trofy Get Tournament was also held by all robots joined. The games were shown on `USTREAM KONDO-ROBOT Channel` from 1:00 pm to 4:00 pm (JST) and videos were keeping in the Channel. The winner of Student Class was JOKER, custom-built by the University of Electro-Communications Robomecha-Kobo Team, Open Class was automo 05(Go-Wan) by holypong-san, Exhibition Class was Chrom-kid by Kupapa-san and Trofy Get Tournament was Frosty by FrostyDesign-san. JOKER and automo 05(Go-Wan) got the right to join the 19th ROBO-ONE tournament would be held on Oct. 8-9, 2011. Final: JOKER vs Tweast, The winner was JOKER. The 1st Stage: Gattender vs BLACK TIGER NEO. BLACK TIGER NEO was autonomous, on the other hand Gattender was radio controlled. The winner was Gattender. The 1st Stage: DeKarle vs automo 05(Go-Wan). The winner was automo 05(Go-Wan). Semifinal: Gattender vs Cavalier. The winner was Gattender. Final: Gattender vs automo 05(Go-Wan). The winner was automo 05(Go-Wan). Semifinal: Garoo vs Gargoil mini. The winner was Gargoil mini. Semifinal: Chrom-kid vs Frosty. The winner was Chrom-kid. Final: Gargoil mini vs Chrom-kid. The winner was Chrom-kid. The 1st stage: Gattender vs Garoo. The winner was Garoo. The 2nd stage: JOKER (Winner of Student Class) vs Chrom-kid (Winner of Exhibition Class). The winner was Chrom-kid. The 2nd stage: Cavalier vs Gargoil mini. The winner was Gargoil mini. The 2nd stage: Garoo vs automo 05(Go-Wan) (Winner of Open Class). The winner was automo 05(Go-Wan). The 2nd stage: Tweast vs Frosty (Jumping robot) . The winner was Frosty. Semifinal: Chrom-kid (Winner of Exhibition Class) vs Gargoil mini. The winner was Chrom-kid. Semifinal: automo 05(Go-Wan)(Winner of Open Class) vs Frosty (Jumping robot). The winner was Frosty. Final: Chrom-kid (Winner of Exhibition Class) vs Frosty. The winner was Frosty. The 2nd and 5th&6th KONDO BATTLE were also reported in this blog. Hi Gremio! Thank you for your introducing this report in your blog.